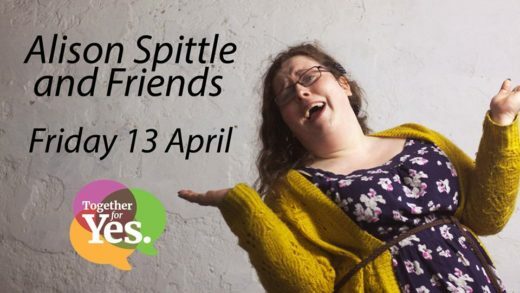 Join some of Ireland’s best comedians, including the award winning star of Nowhere Fast, Alison Spittle, for a fundraising night to support Together for Yes and help repeal the 8th amendment. Hosted by Sharon Mannion, the all-star line up includes Aoife Dooley, Emma Doran, Julie Jay, Ruth Hunter, Breda Larkin, Conor O’Toole and Alison Spittle. All proceeds go to Together for Yes.